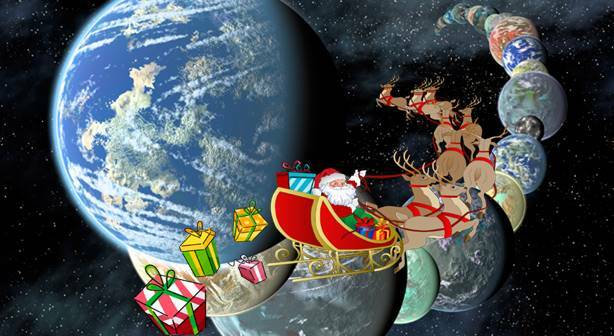 In his ‘days off’, Santa’s been told by the IDWP that, to keep his tax credits, he has to deliver presents to children on other planets as well. This proposition was met with a certain level of complacency from Santa and his Head Elf, Boz, until it was pointed out to them that there might be an infinite number of them. 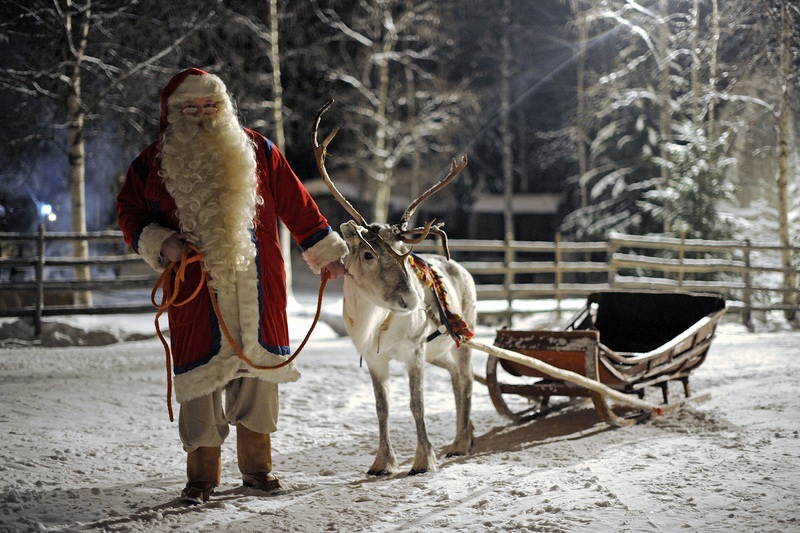 Santa consulted his top reindeer, Rudolph, who, as we know, is magic. Santa: “You’ve got a cousin? Father Christmas turned to Boz, who just shrugged his shoulders. The three of them, now utterly confused, decided to send for Nureyev to see if he could help. A messenger elf, Phiz, was dispatched to St. Petersburg that very evening. Three minutes later, a pure-white reindeer, wearing Cossack boots and a big red star on his nose, landed on the North Pole runway. They all had another sherry to celebrate. Sure enough, when they tried it out, it worked like a dream. Nureyev visited each of the countably infinite planets in 1-P1, 2- P2, 3- P3, … order, Rudolph solved each planet’s TSP non-deterministically and Father Christmas delivered the presents. It looked like his tax credits were saved. Rudolph: “How can it still be countable? You can count up to any planet in the first list but you’ll never finish it. So, you’ll never start the second, surely? It was agreed that more sherry was in order. And it did indeed work. Now, Nureyev visited each of the countably infinite planets in 1-P1, 2-Q1, 3-P2, 4-Q2, 5-P3, 6-Q3, … order, Rudolph solved each planet’s TSP non-deterministically, as before, and Father Christmas still delivered all the presents. Twice countable was still countable, it appeared. But they coped! Nureyev’s strategy of visiting all of the first planets in each list, then the second planets, and so on, still worked. When, for example, they had five lists, P1, P2, P3, …, Q1, Q2, Q3, …, R1, R2, R3, …, S1, S2, S3, … and T1, T2, T3, …, the visiting algorithm was 1-P1, 2-Q1, 3-R1, 4-S1, 5-T1, 6-P2, 7-Q2, 8-R2, 9-S2, 10-T2, 11-P3, 12-Q3, 13-R3, 14-S3, 15-T3, …. The new lists kept coming but Nureyev kept changing the mapping and the delivery algorithm. Rudolph (and his non-deterministic nose) sorted the TSPs and Father Christmas did the rest. Any finite number of countables was still countable. They got through the year. Santa: “I think you’ll find that’s called the Continuum Hypothesis. I believe it’s an undecidable problem. It doesn’t have a ‘yes’ or ‘no’ answer. It’s independent of conventional set theory. They say Gödel the Great was working on that when he went mad. Santa: Well, years of working with undecidable problems got to him eventually. He couldn’t make any decision at all in the end. You see the Continuum Hypothesis can be either true or false, as you want it to be. It doesn’t matter which and it doesn’t affect the rest of mathematics. Poor old Gödel lost it big time when he realised that. He went to pieces; started doing things at random because nothing seemed to matter either way. Then other people found out and no-one trusted him to make a decision at all. It didn’t matter what decision he took in the end because no-one believed him anyway. This entry was posted on Thursday, December 10th, 2015 at 8:19 pm	and tagged with Continuum Hypothesis, Countable sets, Equivalence, Infinite sets and posted in Algorithms, Mathematics, Philosophy, Politics. You can follow any responses to this entry through the RSS 2.0 feed.